Along the way, I take photos that I find interesting, but which do not fit into the theme of other entries. Still, I thought they were worth sharing with you. 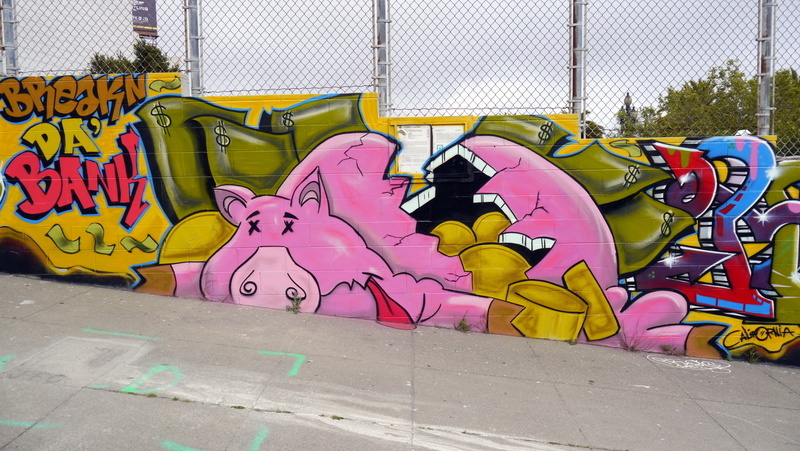 Graffiti in San Francisco, painted on a wall across the street from the United States Mint. 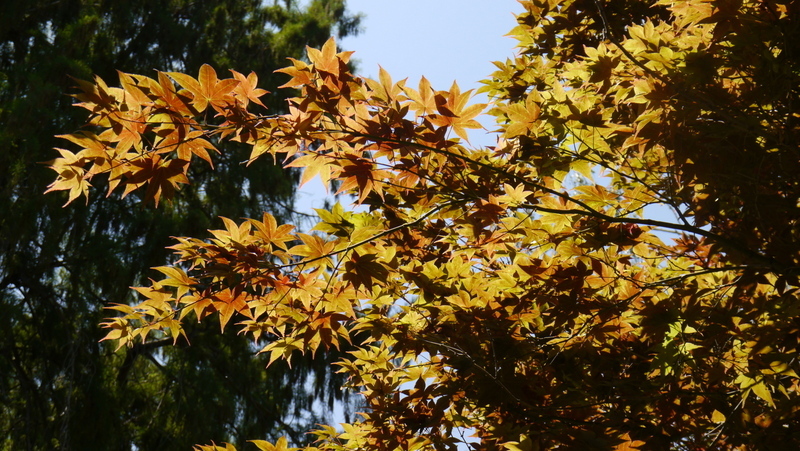 Japanese maple in the sunshine in Sacramento, California. 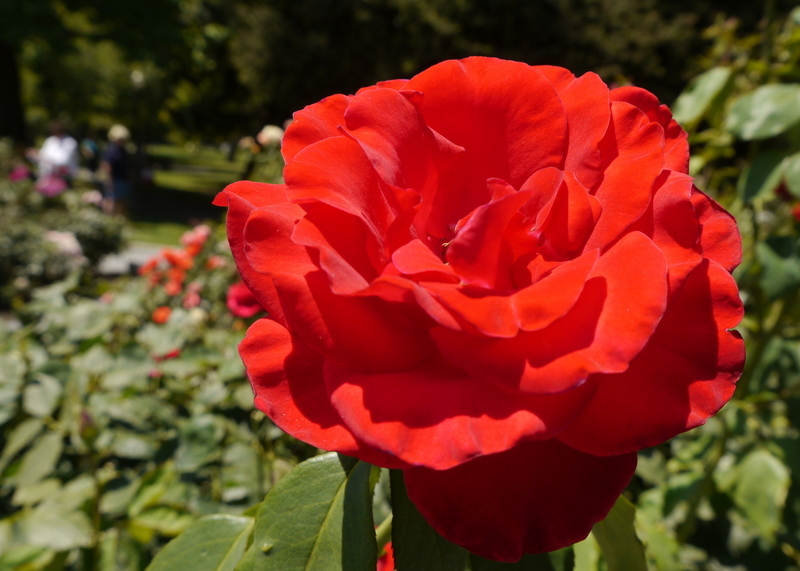 A rose in full bloom in the California State Capitol Building gardens. 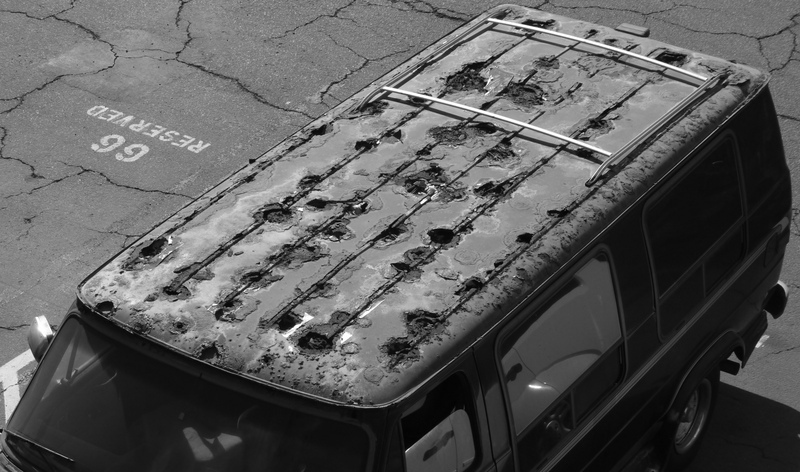 The rusted roof of a van in a condo parking lot in Kihei, Maui, Hawai’i. Rusted chain in the tidepools along downtown Lahaina, Maui, Hawai’i. 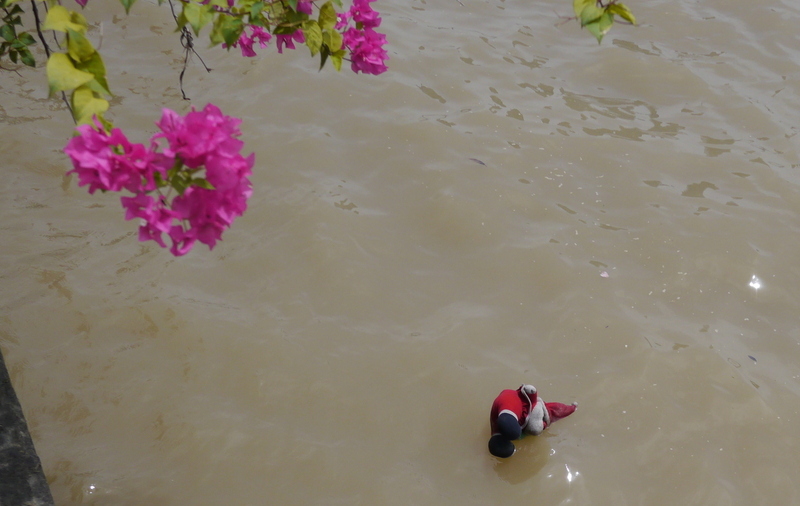 An elephant doll dressed as Santa Claus floats in the Chao Phraya River in Bangkok. 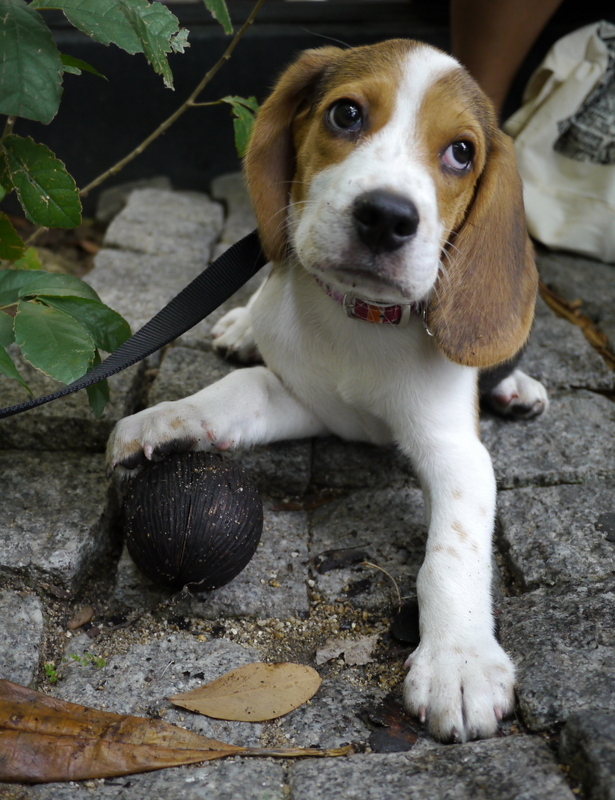 A three-month old beagle plays with a seed pod at the Ma Du Zi Hotel in Bangkok. This entry was posted in Uncategorized and tagged Photography, Photos by christao408. Bookmark the permalink. I like how you’re adding some black and white photos to your blog. 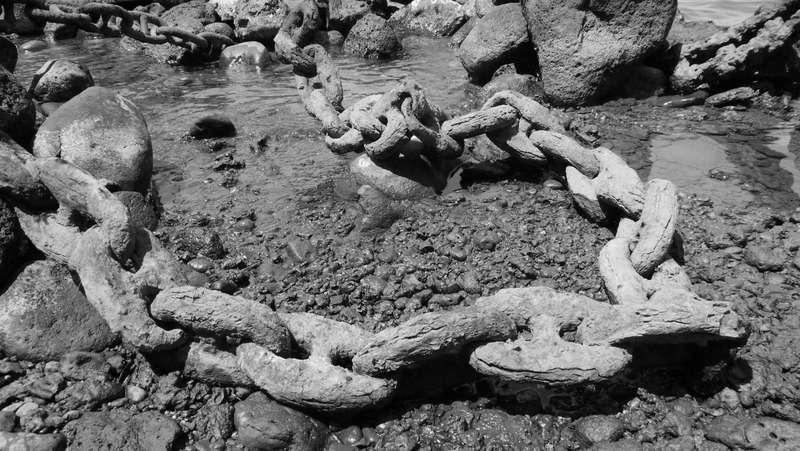 The one with the chain looks interesting – especially the texture of the chain and the shoreline. That van’s roof is something. Causes me to have horror visions, but the beagle made up for all of it. I feel warm and fuzzy now. i really like these shots. i have always love B&W photos. n that last pic… oh, i just want to have that dog. i mean, just look at those sad puppy eyes. @beowulf222 – That’s why I ended with the puppy picture. @ElusiveWords – I was curious how old the chains were. Have the impression they may be many decades old. Lovely photos – thanks for sharing! I like the use of black and white in the collection. They are very expressive and good ending with the pup! Very good hodgepodge of photos. The clues on the Beagle photo being taken in Bangkok are there but most folks would not have known if you didn’t tell us that it is so.Rust near oceans and areas that are “salted” is a pretty terrible thing for owners who live in these areas. Hence never purchase used vehicles from those areas. However desert areas help enable steel vehicles to last forever. I suppose my area sees a lot of ancient vehicles that seem locked away in a time warp. I loved seeing these. The elephant santa clause reminds me of the kids in the streets of india dressed as SC. omg, that’s where my elepant santa ended up! @rudyhou – I love dogs because they often have such cute eyes, but I love cats because of their lithe bodies. @yang1815 – That explains the rust. @Vitamin_D – You are very welcome. @AppsScraps – See? Now you know. @ZSA_MD – Really? Why do they dress up as Santa? @grannykaren – Interesting textures in that picture, aren’t there? @PPhilip – The effects of nature on even the strongest of materials are pretty awesome. Makes you realize that everything is, indeed, impermanent. @venice – Oh, you have a beagle? They are one of my favorite breeds, although the baying can be annoying. @jace1982 – Thank you. @Fatcat723 – Thanks, I gave a lot of thought to the order of the photos. @mizz_chan – You are most welcome. You’ve left Hong Kong already, right? @christao408 – i do see the back open up once in awhile though. It is kind of like a storage?! @christao408 – Yes! I got back to Vancouver at the start of July. Time sure flies. Wish I had the opportunity to visit you in Thailand. Maybe next time!